LEXINGTON, Ky. (July 3, 2018) — University of Kentucky undergraduates boarded a bus this past spring for a cross-country trip to the University of Central Oklahoma in Edmond. 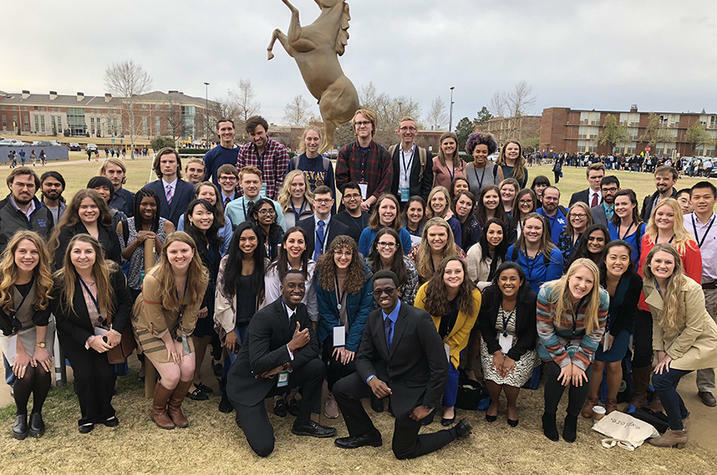 Accompanied by several adult escorts, the 89 students were traveling 12 hours to present their research at the 2018 National Conference on Undergraduate Research (NCUR). Before they even boarded the bus, this team of undergraduate researchers had made UK history. 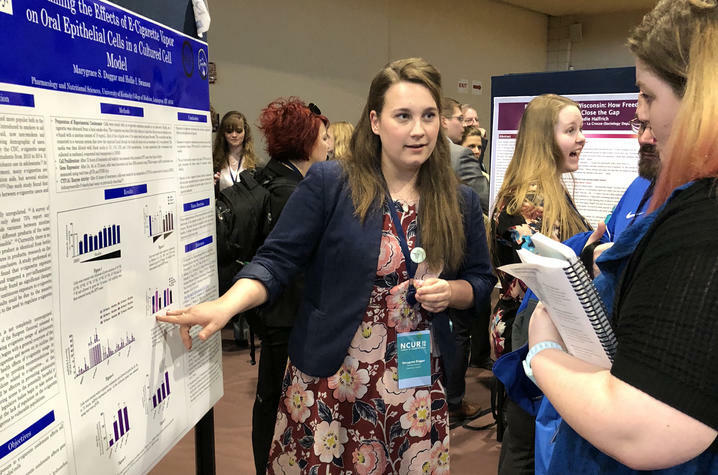 A few months earlier, 92 UK undergraduates had submitted their research abstracts in hopes of winning the honor of personally presenting their own research at NCUR 2018. To everyone’s amazement, 97 percent of those applicants (a total of 89 UK undergraduate researchers) were accepted. Only the host facility, the University of Central Oklahoma, had more student participants. 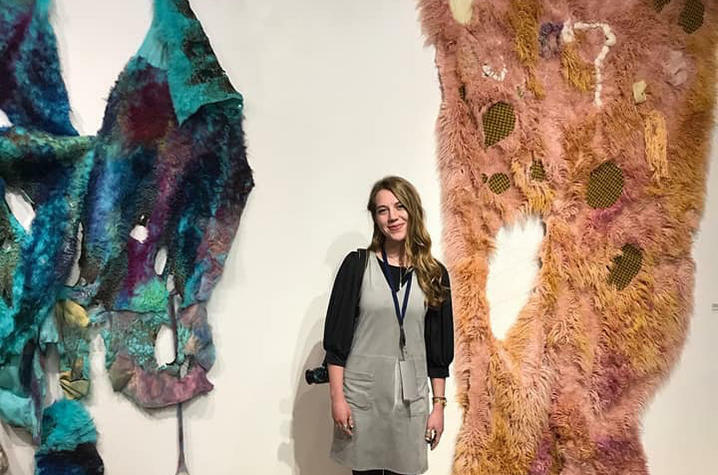 “UK has repeatedly been well represented at this conference for research conducted by undergraduate students, but none of us ever dreamed of a 97 percent acceptance rate,” said Bessie Guerrant, associate director for the Office of Undergraduate Research. The group represented a diverse cross-section of the UK student body, with the majority coming from the College of Arts and Sciences and the College of Engineering. It was only four years ago, in 2014, that UK hosted the same national conference for young researchers. A record was set at that event as well — NCUR’s largest number of presenters and attendees. NCUR is an annual student conference dedicated to promoting undergraduate research, scholarship and creative activity in all fields of study. Divisions encompass the arts and humanities, biology, chemistry, education, engineering, geosciences, health sciences, mathematics, computer science, physics, astronomy, psychology and the social sciences. The annual NCUR conference creates a unique environment for the celebration and promotion of undergraduate student achievement, provides models of exemplary research and scholarship, and helps to improve the state of undergraduate education. Students can present their research and creative works in oral, poster or performance/visual arts presentations. Working with a faculty mentor, undergraduates apply to NCUR by submitting a 200- to 300-word abstract that clearly states their central research question and/or purpose and describes their work. Annually, the UK Office of Undergraduate Research financially supports students to present their research or creative work at NCUR. Thanks to three generous donations, all students accepted were able to participate. Alexander Compton, a graduating senior pursuing two bachelor’s degrees in history and foreign language and international economics-German at the time of the conference, chose to present his senior thesis for a history degree at NCUR at the urging of UK History Professor James Albisetti. It was his first experience with NCUR. “I decided it would be a good platform to present my senior thesis. My thesis involved about a year and a half of research that I did here and abroad in Germany, as well as different archives online,” he said. Compton also thought it would be a great opportunity to get to know other people doing similar research at other universities. “I was able to pull all these different concepts from all these different places and apply it to what I was studying, but from a different perspective. And that was the most rewarding part for me,” Compton said. A junior from Baton Rouge, Louisiana, majoring in chemical engineering on the biopharmaceutical development track, Marygrace Duggar was thoroughly impressed by her experience at NCUR 2018. “It was wonderful. I really enjoyed the breadth of the research that was on display; I got to see some really awesome projects that were in my area of expertise, looking at cell pathways and proteins,” said Duggar, whose research of e-cigarettes has determined the product has “negative impact” on the health of the mouth. Duggar’s learning experience wasn’t over after the conference. After a “banner three days of running around and learning and talking to people” one would think the bus full of tired people would be quiet on the way home. Nothing could be further from the truth. After continuing her research on campus this summer, Duggar plans to begin the process of publishing her e-cigarette research during her senior year at UK this coming fall. Matthew Sirrine, who was a graduating senior in psychology when he attended NCUR 2018, called the event “the best experience I’ve probably ever had at UK, just in terms of presenting that research. Sirrine’s research involved atheism, “specifically comparing atheists to theists, in terms of their life satisfaction and trying to see if atheists have lower life satisfaction compared to theists and based on the level of discrimination atheists face due to their beliefs,” he explained. “Research can be a lonely kind of experience,” Sirrine said. “So being able to present it and get feedback and just to be in a (temporary) ‘community’ where people are excited about what you’re doing … was very rewarding and an incredible experience all around. “I think the undergraduate research experience is one of the best things (students) can do at UK. For me, personally, it changed my life. It gave me a huge sense of confidence and allowed me to express myself in a way I never thought possible until I started doing it. So, I recommend it to anyone, regardless if your field has a science focus or not. As an enhanced institutional member of NCUR, UK has been a staunch supporter of the National Conference on Undergraduate Research since the mid-1990s with several UK faculty and staff accepting leadership roles in the national organization. NCUR 2019 will be held at Kennesaw State University in Kennesaw, Georgia, April 11-13, 2019.